Progress is good and it would be nice if I could start my planned voyage to the antipode from Crookhaven Ireland end of April 2018, after first having tested her in 2017. My first planned stop is Puerto Santo, Madeira, a distance of about 1200 miles. After that I will sail south, staying west of the Canary and Cape Verde islands. Crossing the Equator at about 20 degrees west, going south of Africa and Australia. A convenient port of ending the voyage would be Dunedin in New Zealand, that distance is about 14 000 miles at sea. When arriving there I would be 80 years old and having accomplished the voyage would be a fine feeling. I am getting conscious about the fact that the voyage will be more convenient if I can have more load capacity. It would make it possible to add luxuries like toilet paper, fruit and warm clothing. 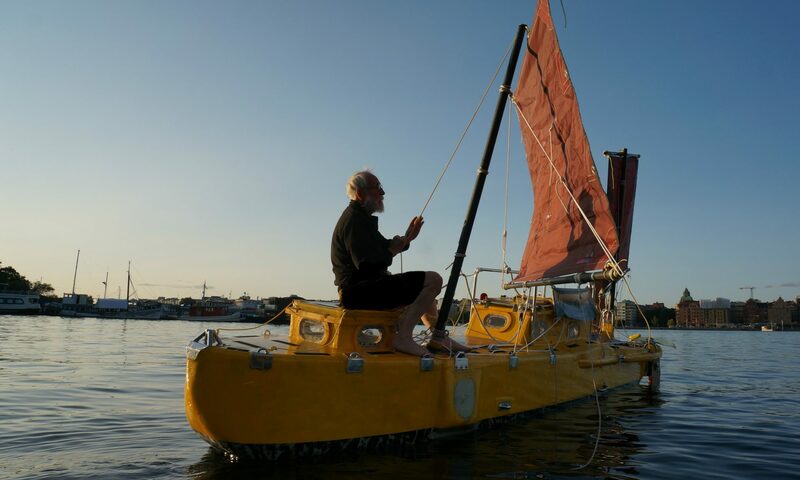 Also a longer boat will make less resistance and be a bit faster reducing the amount of food and toilet paper used. The stretch will add about 1.2 meter to Ex Lex length. It will give me more storage space and a bathing platform. I am not in the record business any more so I can build to my own design philosophy: small, but long and narrow. I have always admired Captain Voss boat Tilikum. L. Francis Herreshof another one of my influences did likewise. 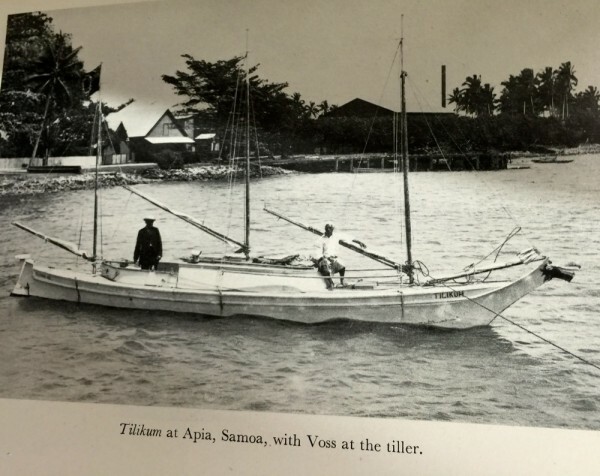 Tilikum she started as an Indian dugout 11.6 m length, beam 1.67 draft 0.6 m sail area 21 sq meter. Ex Lex started out as an experimental boat and still is, but she have shown her own will and my ambitions have grown. A long narrow boat works on the same principle as the battering ram, a small frontal area and a lot of force behind it. Resistance is mainly a matter of frontal area. I know that there is such a thing as frictional resistance but the effect of that is rather marginal especially to windward in rough seas. In heavy weather its mainly air resistance and the sea waves hitting the boat in the front that slows her down. Displacement/Length ratio is a dimensionless number that indicates the slenderness of a boat. By stretching Ex Lex it decreases from 289 to 173 even though I have calculated with an added weight of 200 kilos, the lower that lower that number is the less friction. 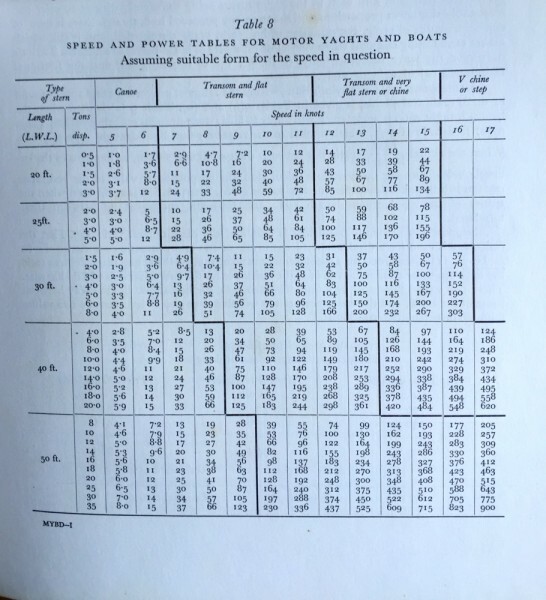 In the table below one can see that for a 2 ton boat, if one increases waterline from 20 to 30 feet the needed horsepower to drive it at 6 knots decreases to less than half, from 8 horsepower to 3.6. The table is from Philips Birth. I know that changing a boat in mid-building is not very rational, but after cutting up one boat I cannot afford to cut up this one to. 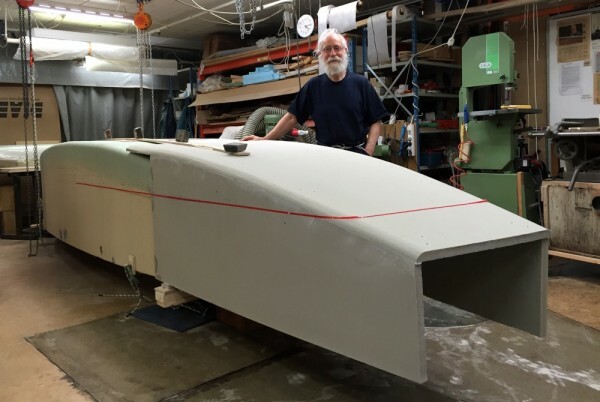 After New Zealand I hope to be able to start with Boat Ideal that is now 9 meter long with a beam of 1.5 meter, draft about 30 cm, strong bottom for beach landing. I keep adept it as my understanding of how I want to live my life develops. More and more I like to spend long time at sea. I am now 77 years old and I am getting nostalgic. Life on land is no longer what it was when I was young, but at sea it is. It’s a never changing environment in which I feel at home and have control. The average modern man does not get much natural satisfaction. A lot of artificial stimulants like TV consumption synthetic food and drugs have been introduced to satisfy him. They do not do a good job of it. I like to live more like free animals live. The reptile brain where or feelings are has not changed for millions of years, only layers of sophistication has been added to it, nothing that makes us more happy on the contrary. Only free animals are never bored. Physiologically all mammals are very similar, even their brains. That’s is why drug companies tests drugs on rats. The pleasure of artificial stimulants, like TV consumption artificial food and drugs are overestimated. 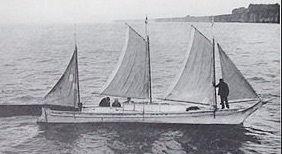 Fig 4 The stretch hull.